Imagine walking into a house where a family has moved out…in a hurry. All that is left are a few cheap pieces of furniture, old clothes (mostly bundled into black garbage bags), broken toys, boxes of unwanted books, sticky pans and rancid bottles of vegetable oil. The soiled carpet is littered with odd bits like pencils, rubber bands, mate-less slippers. You get the picture. As the 27th picker entering this house hoping to find treasure and instead seeing this mess, my heart sank. But I was determined to find something in the flotsam and jetsam. At least ONE thing. Just one. And I begin digging. Later I met up with my friend Diane (she had been the 5th person into the house) and asked what she found. Turns out she left the sale after 10 frustrating minutes having only bought a few bathroom products. 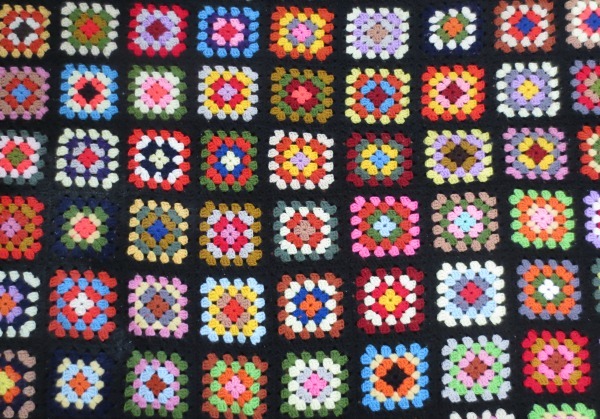 My first find…an amazing 1950s/1960s Peerless 100% alpaca black swing coat unearthed from a packed garbage bag (couldn’t get a good photo of it for you), a handmade granny-square blanket (sized for a twin bed) bypassed by many though I have sold several, a retro 1970s Commodore 9D31 calculator (still need batteries to see if it works…fingers crossed), a travel set of Pavilion Dominoes and a few books. When I left the house over 20 folks were still lined up waiting to get in. I wanted to tell them not to bother, but who knows…they may find goodies too! Any good finds to share?? ← What’s Your Typical Day Like?